If you are seeking thrill on a budget or looking for that spiritual experience or just want to eat and relax all day without spending much, Rishikesh would be the place for you. Nestled in the quaint little state of Uttarakhand, this yoga capital of the world sees people from all over the world booking their flight tickets so they can visit the place that was made famous by the Beatles. Despite the recent calls on environmental regulations, there is still a long list of adventure sports that you can enjoy. There is a reason why river rafting at the Ganges hogs all the attention. While you might notice the forests around the Ganges on the stable patches, the icy rapids will demand your attention after every few minutes. Cliff jumping at maggi point towards the end of the rafting session enhances this adventure. 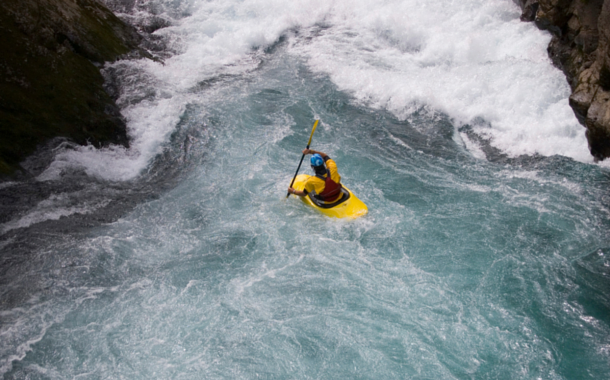 If you’re a skilled swimmer and are brave enough to face the rapids on your own, you could also opt for kayaking. For those who find heights thrilling, you could try waterfall rappelling, bungee jumping, swinging and flying fox. There are probably more activities in Rishikesh than you can find time for. After your great adventures, you could try camping in the riverside, waking up to the sounds of chirping birds and flowing waters. If you still have time to spare then mountain biking would be an exciting way to explore the area. With yoga centres everywhere, you need not feel guilty about eating that extra slice of pizza. Needless to say, it is best to keep the precautionary measures in mind at all times. With the holy river flowing through the town, one can’t help but breathe in the spirituality. A dip in the ghat of Triveni whilst you witness the Maha Aarti in the morning and evening will sooth your senses. Bharat Mandir, one of the oldest temples in India, is located here. 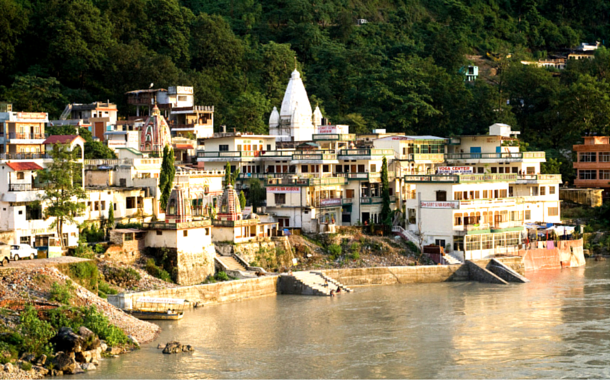 Legend has it that Rishikesh would have been non-existent had it not been for this temple. This temple also finds its way in the ancient texts such as the Purans and the Mahabharat. For the not so religious people, there is also a museum at the premises consisting of sculptures and pottery unearthed during excavations. 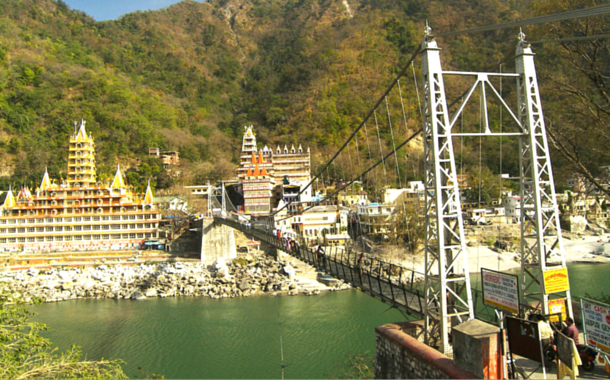 Any trip to Rishikesh is incomplete if you miss out on the Lakshman Jhula, an iron suspension bridge built in 1929. It is said that when Lakshman had to cross the Ganges, he did that with the help of jute ropes. Quite a tricky manoeuvre! It’s lucky that this bridge can take care of that now. Among the oldest ashrams of Rishikesh would be Geeta Bhavan, where around 1000 rooms are available without any rent. Discourses and Satsangs are organized on a regular basis. Within the campus, grocery shops, sweet shop, Gita press book shop, Ayurvedic department, etc are located selling items at reasonable prices. If you just want to sit back, relax and read a book, Rishikesh will cater to your needs as well. With numerous hipster cafes in town, serving various delicacies (no non-vegetarian or alcohol before you get your hopes up), makes for a relaxing weekend getaway. With the Ganga view and laid back atmosphere, you can spend hours at the restaurants, eating delectable food and playing carom with your friends. Or who knows, you could even make new friends. Either looking to bungeejump off a cliff or searching for deep soul cleansing, Rishikesh is the perfect answer for you. With the plethora of clean and budget accommodation and more restaurants than you can count, the only thing you need to do is pack your bag, book your ticket and leave your troubles at home.